Not my best photo, I know, but we ate it before I could get a better one. Geez… Time is just flying by. I feel like such a loser because people keep asking me “so, what have you been up to?” and I swear I have no idea. Apparently though, I’ve been quite busy because I can’t seem to get anything I really want to do done – like write this blog! Ok, so I was really sick for a week, then it was time to prepare for the girl’s birthday, then it was a big party weekend between the girl’s bounce house party with 19 of their closest friends and the Superbowl. So then, I had to clean for the last two days in preparation for the house cleaner to come clean the house today. I swear sometimes the preparation is more stressful than just doing it myself but I fear the bathrooms would never, ever get clean if she didn’t come. My husband thinks I’m insane for the frenzy I work myself up in. I think he could be way more helpful than he is. I’m sure that doesn’t sound familiar to anyone. Anyway, I successfully made it out of the house before she got there today so maybe she will think I had something really important to do, preventing me from picking up any of the shoes scattered around the bedroom. I always fear she is judging me… Maybe I am insane. I’ll move on now. 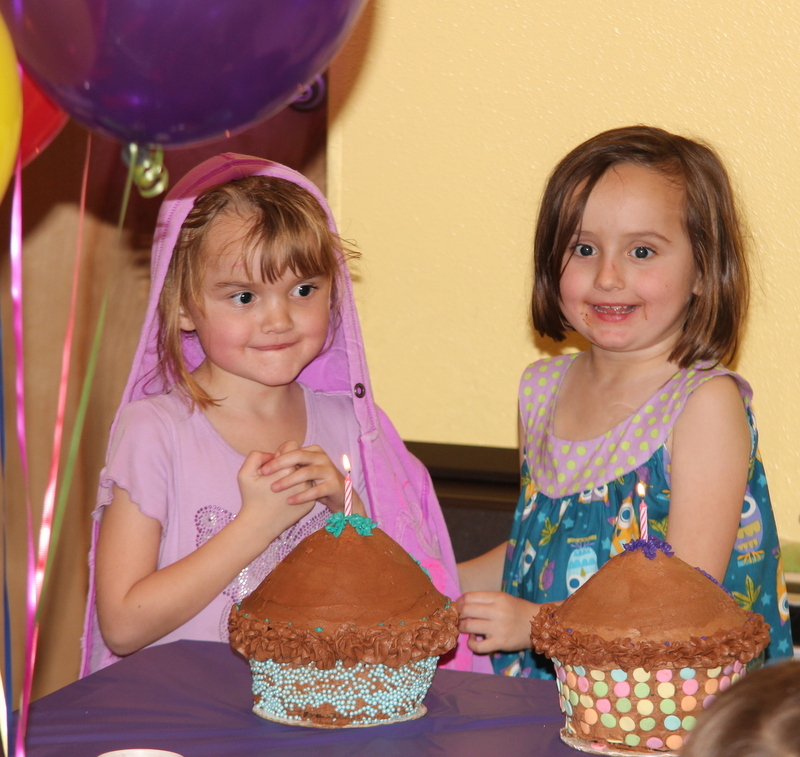 Hailey and Ella had a very fun 6th birthday! They wanted a cupcake themed party (I was told princess and fairy themes were “too babyish”. When did this happen?!!) so I made two giant chocolate cupcakes as requested by the birthday girls. I also made a giant vanilla cupcake, requested by my niece, and they were actually really fun to decorate. We watched the Superbowl on our friend’s new 60″ TV (it was like we were there!) and I brought this chili to share. 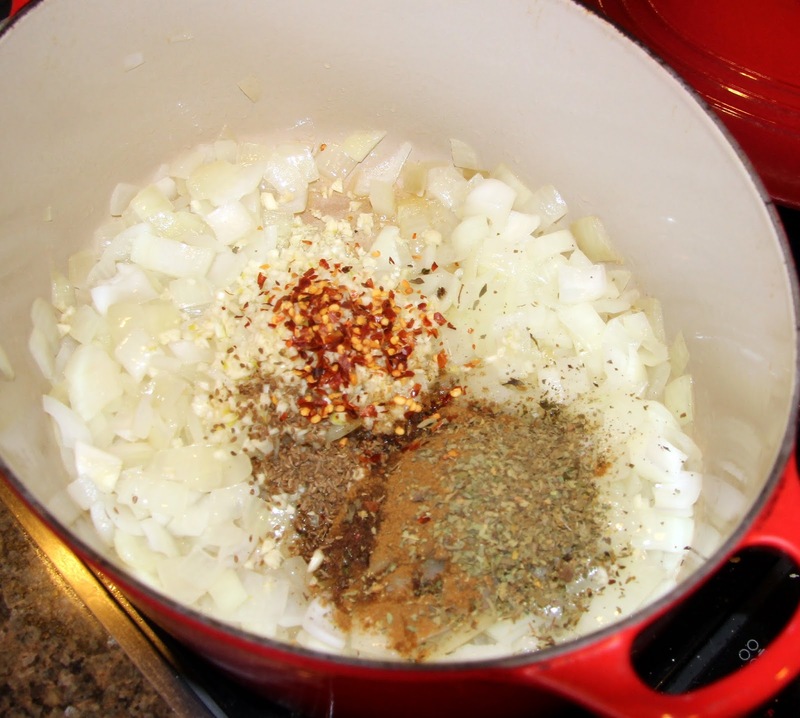 It’s my go-to when I don’t want to make the same old red chili I make all the time. I found it on one of my favorite recipe sites, epicurious.com, and adapted it to make it a bit healthier. 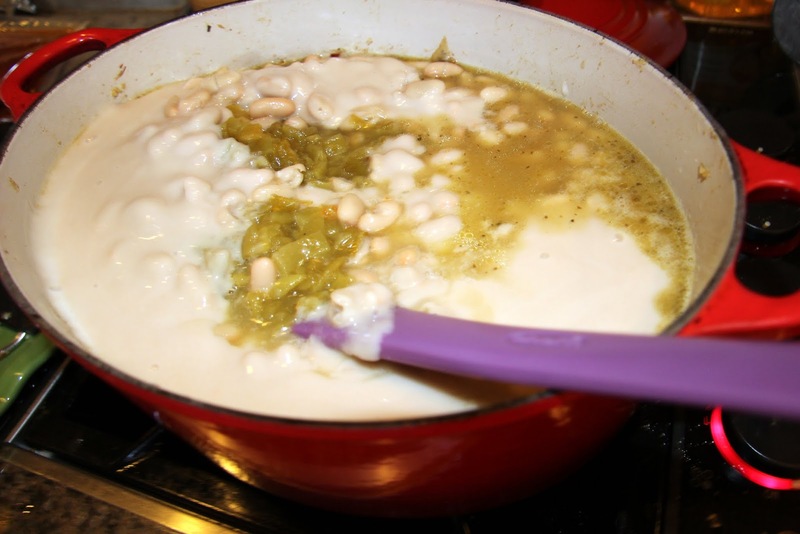 Instead of using heavy cream, I pureed some of the beans to thicken it and make it really rich and hearty. 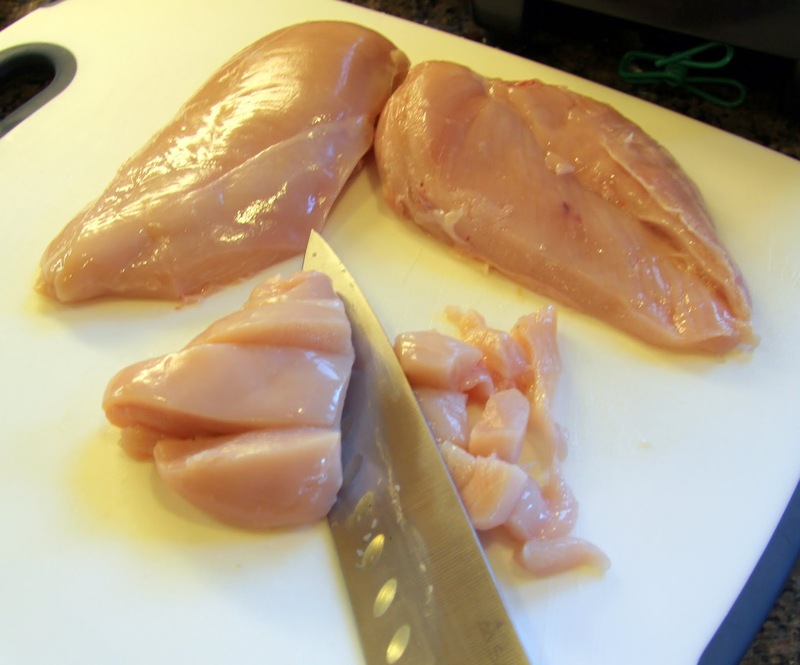 I also used chicken breasts instead of thighs this time because that’s what I had, and I really preferred the texture. Do what you want though, breasts, thighs, shredded rotisserie, they all work. You might think aniseed is an odd ingredient to add to chili, I was a bit suspicious myself. Trust me though, it adds really great flavor. I doubled the recipe so it feeds a crowd. 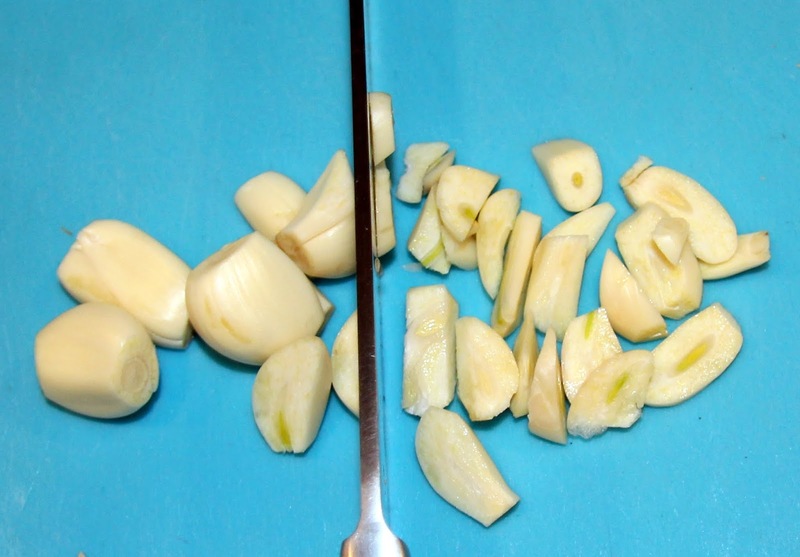 You could cut in half or make it as is and freeze what you don’t need. 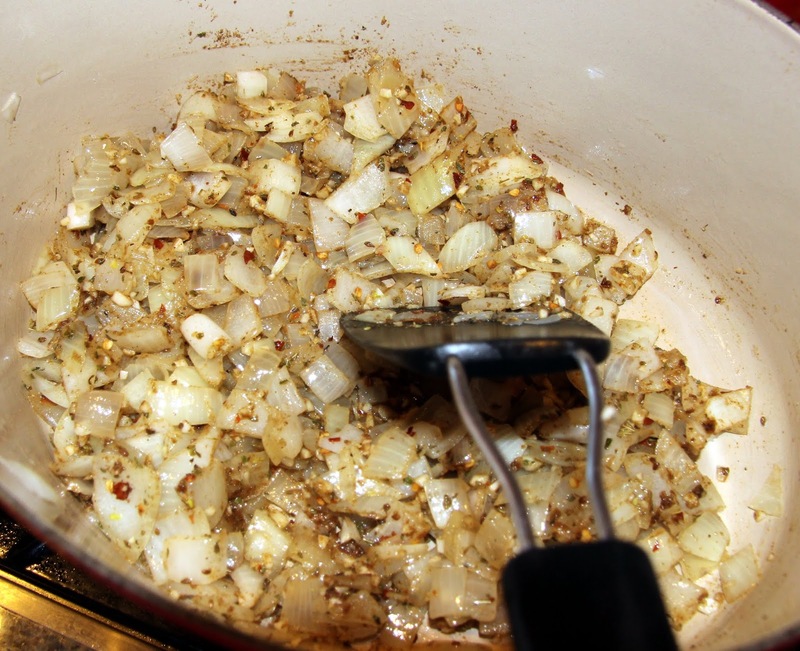 Chop onions and place in a large pot or dutch oven with the oil. On medium heat, saute until they soften, stirring frequently. 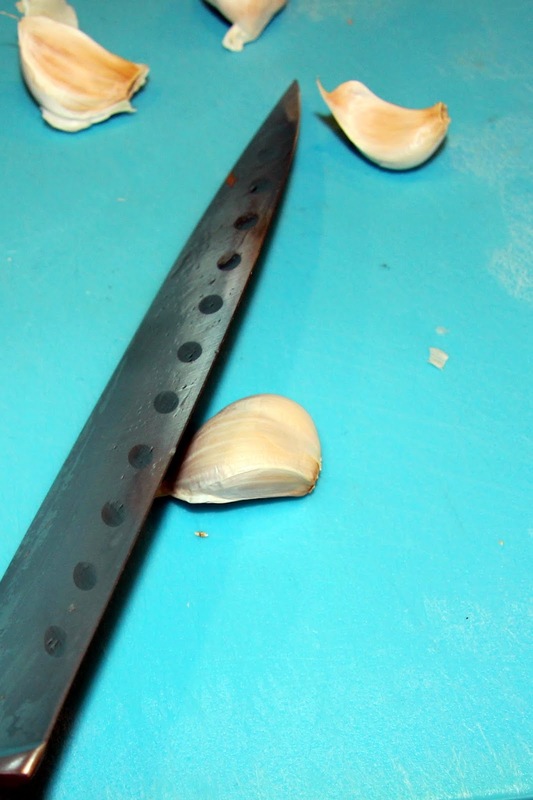 Meanwhile, chop your garlic. 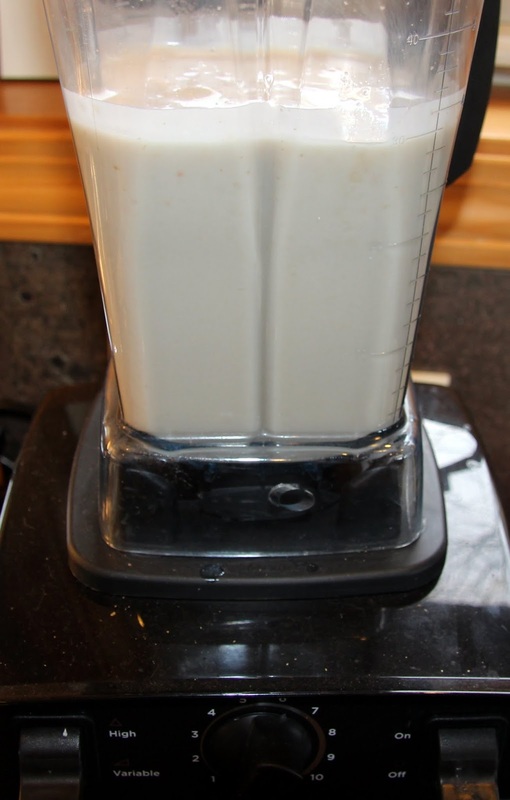 If you have a food processor, you should use it. If not, here’s an easy way to do it. 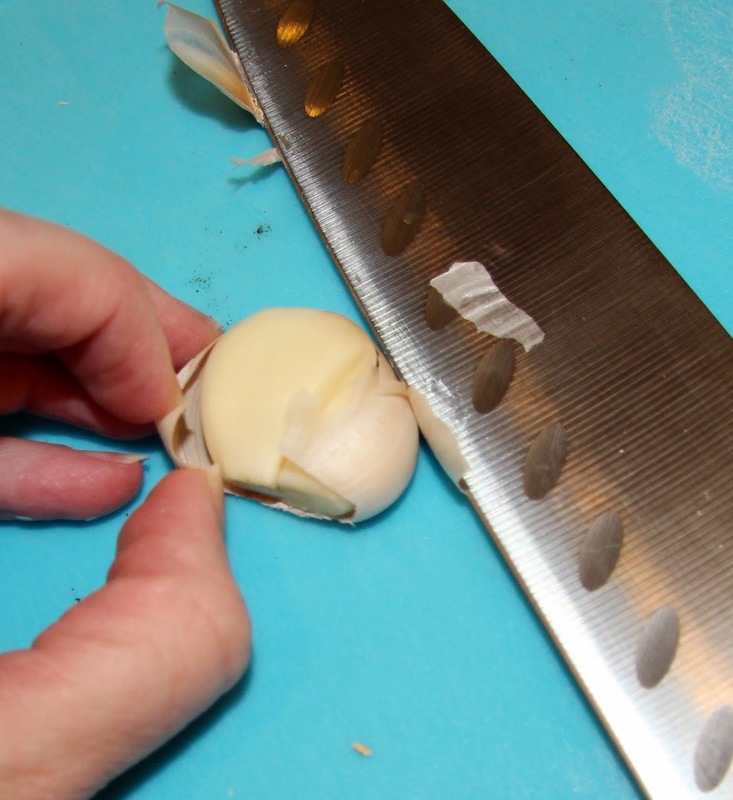 First, peel the garlic by firmly pressing on the cloves with the flat part of a large chef’s knife. This will make the peel come off quite easily. 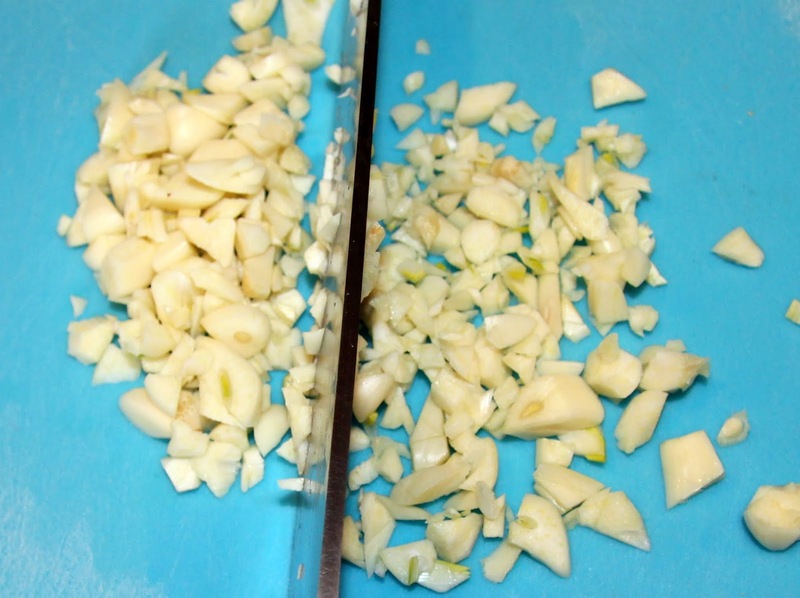 Next, group the cloves together and begin chopping. 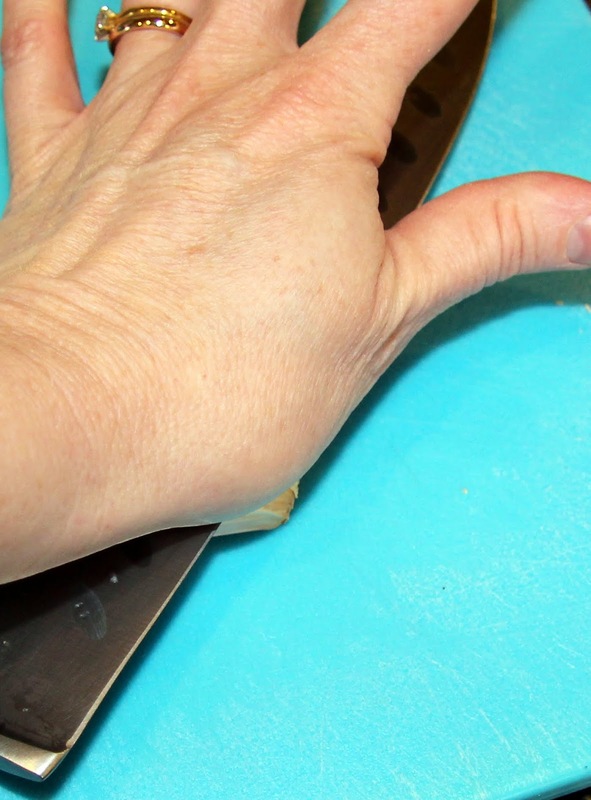 Continue to chop until you produce a fine texture. 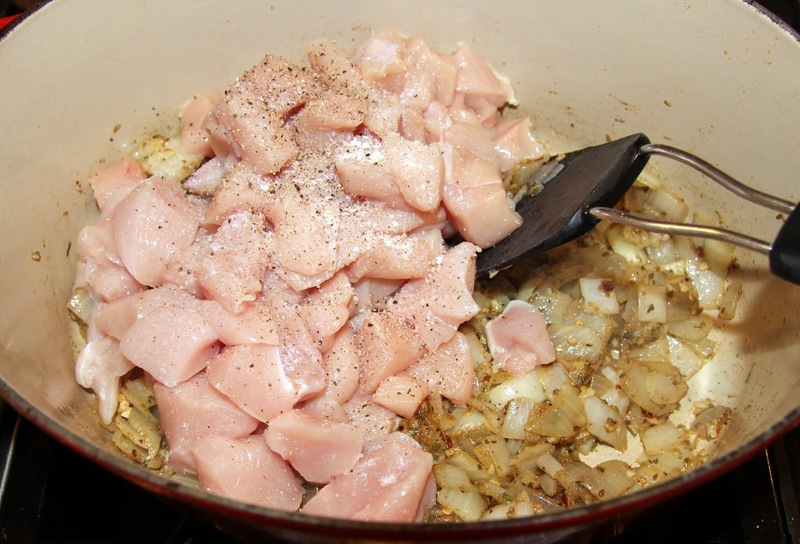 Dice chicken breasts in bite size pieces. 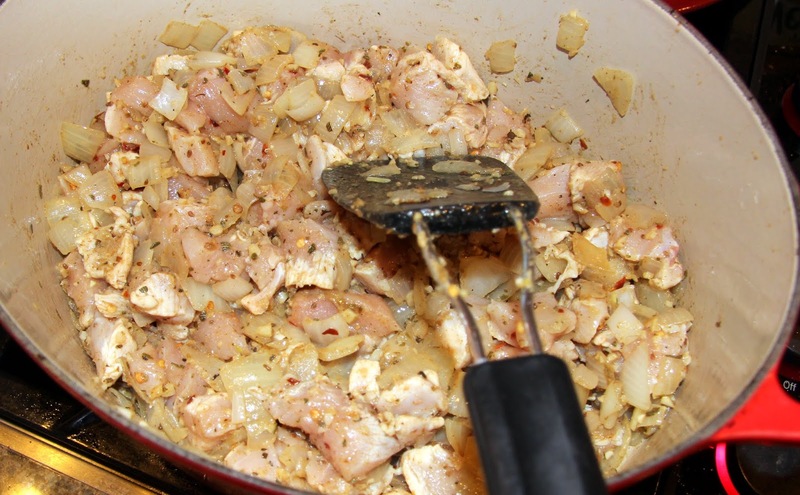 Then add to the pan and saute with onions and spices until cooked through, stirring frequently. 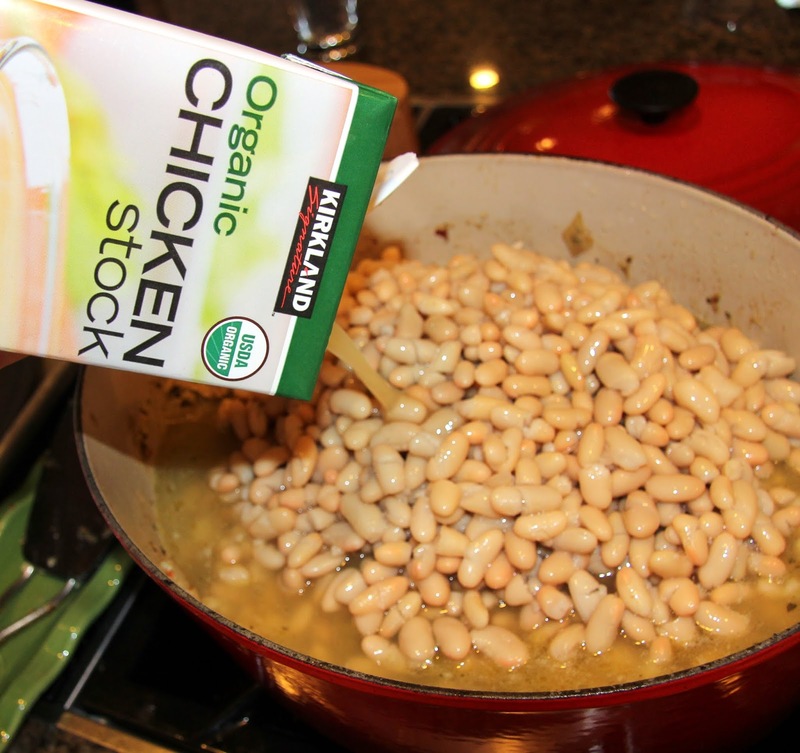 In a large colander set in the sink, drain liquid from 4 cans of beans and rinse them with water. 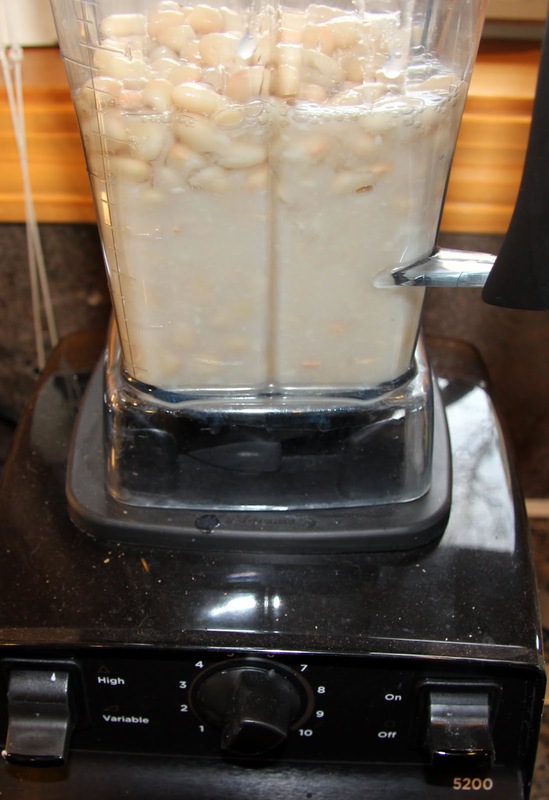 Place the remaining 2 cans of beans, with the liquid, in a blender or food processer and blend until smooth. 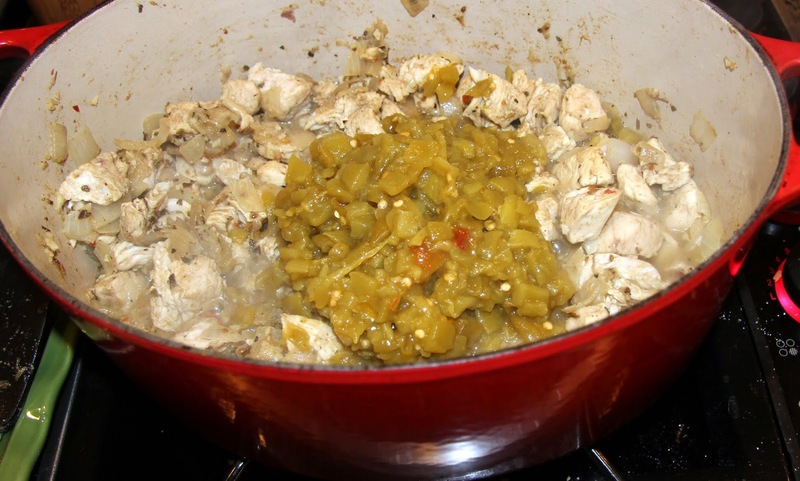 Stir in diced chiles, beans, chicken stock and pureed beans to cooked chicken mixture. 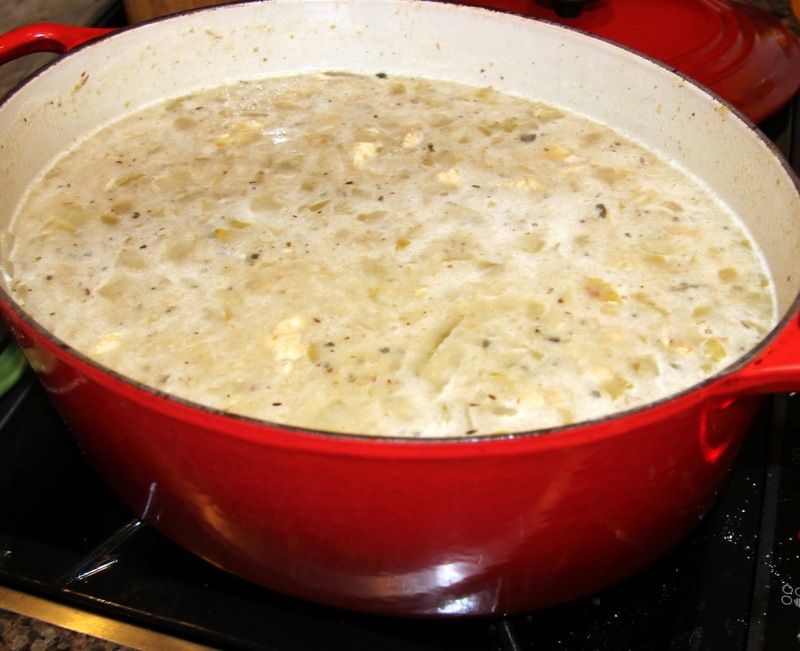 Bring to a simmer on medium high heat, stirring frequently, then reduce heat to low. Cook, stirring occasionally, until thickened, about 1 hour. 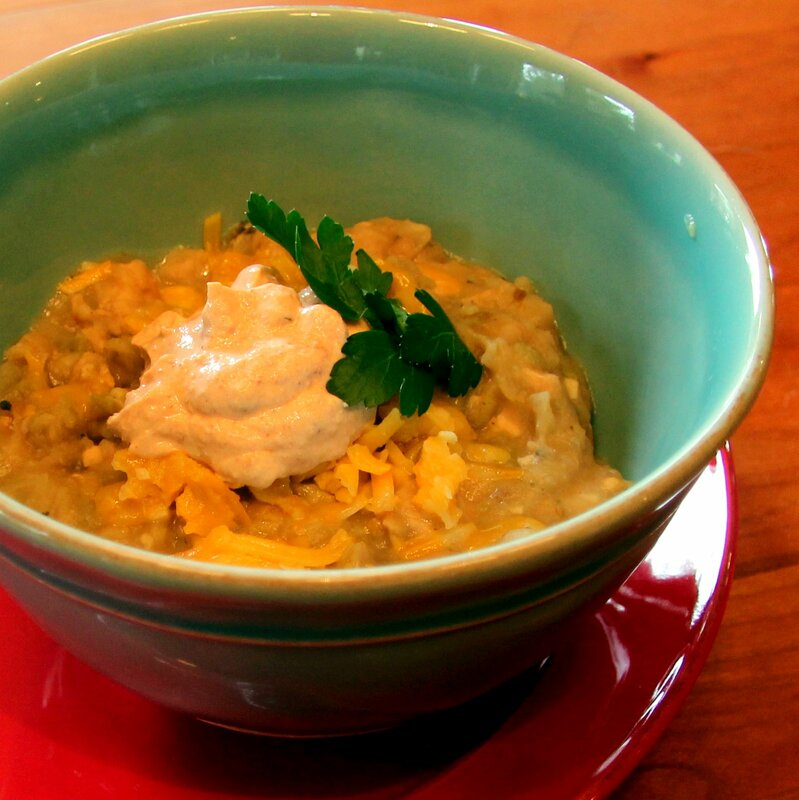 Serve with cilantro, shredded cheese and, if desired, chipotle sour cream. I came up with the sour cream to give the chili a spicy, smoky kick and it tasted great! 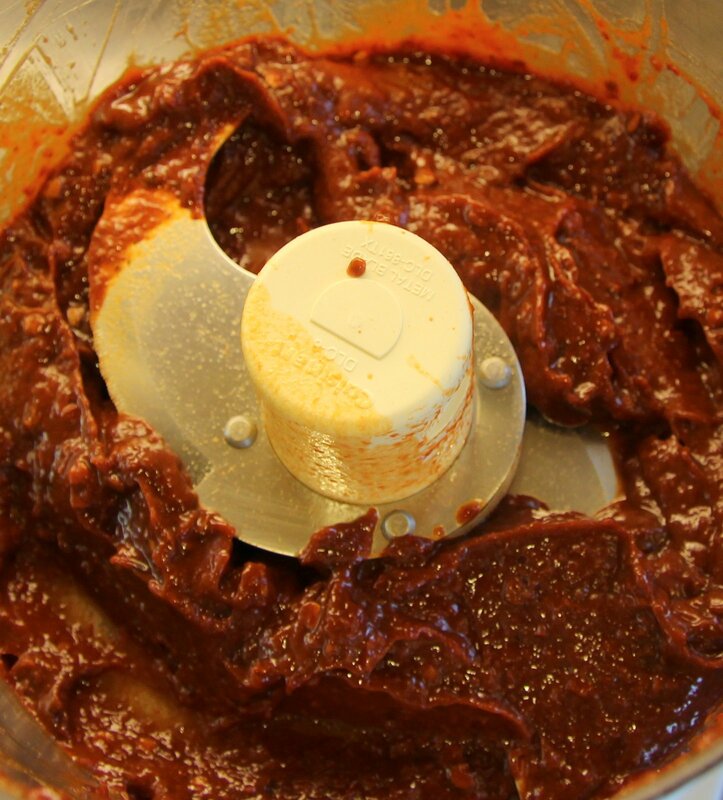 Place all ingredients in a small mixing bowl and stir until fully combined. 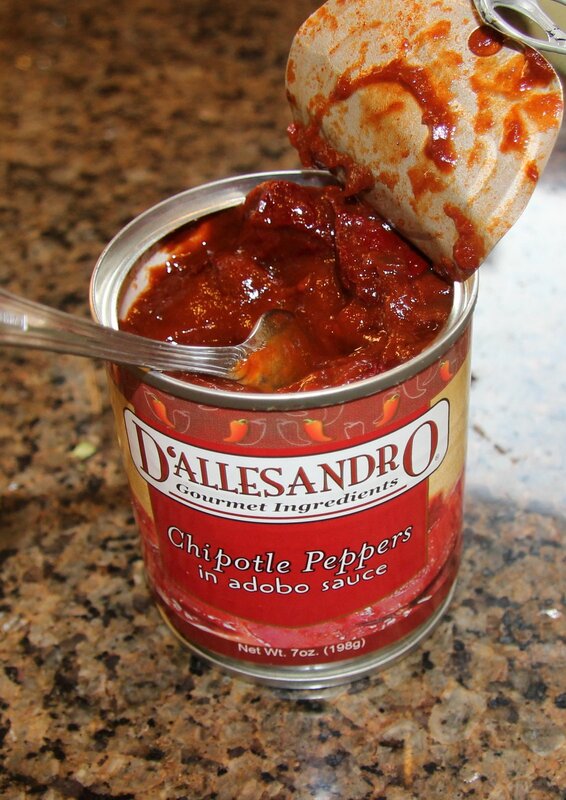 I suggest starting with 1 TB chipotle in adobo then adding more if you want it spicier. This is great on tacos, fajitas, etc. 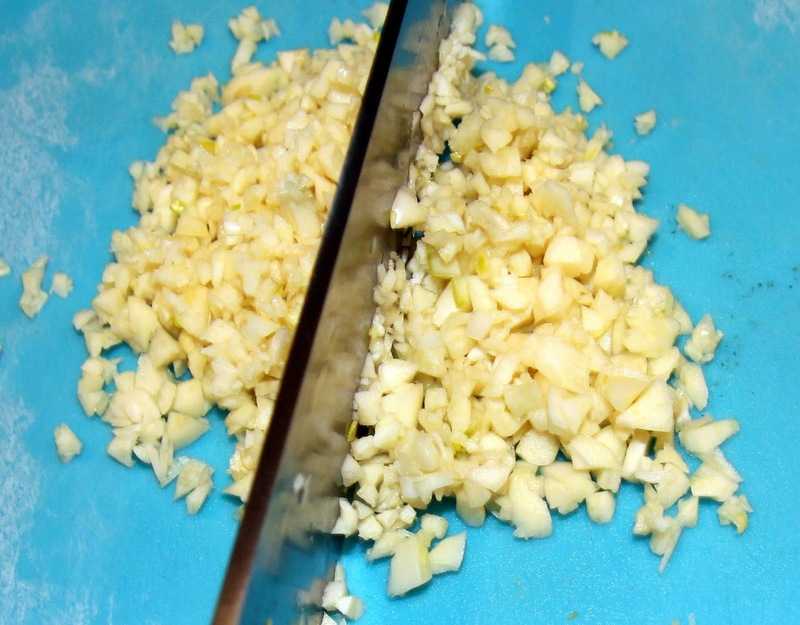 and you can thin it out with more lime juice for a great salad dressing! Can’t wait to see you this weekend my friend! Sorry it’s been a rough week :(.